not posting on tuesday, as i plan to have dinner with my boy, then perhaps hit the fuddrucker's show in el toro. so here's a second post for today. enjoy! 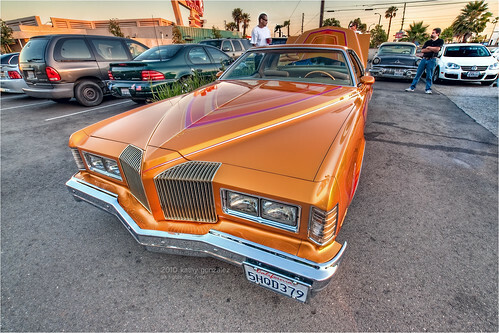 the pinstripe detail on this ‘76 pontiac grand prix is amazing. you really must see this one in person. the color is gorgeous and the wavy cross hatching on the center of the hood is so meticulous, it's hard to imagine how painstaking it was to achieve, unless you are familiar with masking for airbrushing back in the day. found it this day in the back lot of the downey broiler, but also saw it two days later at ruby's in whittier. should have got it a ruby's with the sun setting on it...the color was irridescent....but i didn't...don't know why. should've would've could've. maybe next time.